Select pages at random by clicking numbers above or use navigation arrows below to index through pages in this category. Use thumbnail view to view all pieces on one page. 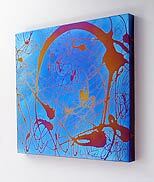 The combination of abstract painting techniques and titanium coloring on formed metal to emulate stretched canvas. In the same way paint is thrown at a canvas, the coloring techniques used here produce sensuous, organic flowing lines.